Rootkit Remover deals easily with Mebroot, all TDL families (TDL/SST/Pihar), Mayachok, Mybios, Plite, XPaj, Whistler, Alipop, Cpd, Fengd, Fips, Guntior, MBR Locker, Mebratix, Niwa, Ponreb, Ramnit, Stoned, Yoddos, Yurn, Zegost and also cleans infections with Necurs (the last rootkit standing). Please note that the list is a bit outdated - new rootkit families are added as they become known. 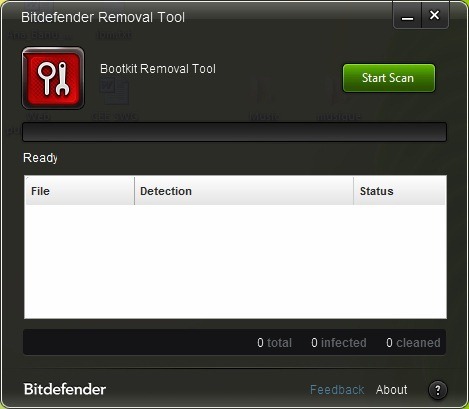 3,850 6,008 BitDefender Labs <img src="https://www.oldergeeks.com/downloads/gallery/thumbs/bitdefenderrootkitremover_th.png"border="0"> Aug 09, 2018 - 20:15 3.0.2.1 6.93MB EXE , out of 10 Votes.